Don’t look straight away or you might jinx it, but Facebook’s stock price today – finally – surpassed the $30 mark again (per @CNBC). At the time of writing, shortly after market-open, the stock price is up almost 4 percent to $30.2 per share. This is the first time the social networking giant’s share price was at this level since mid-July 2012, nearly 6 months ago. This could have something to do with the fact that Facebook just invited members of the press to an event on January 15th, to talk about ‘what they’re building’, but that’s doubtful. More likely, it’s simply a matter of increased investor and analyst confidence in the company’s long-term prospects (their mobile advertising suckage notwithstanding). We recently reported how an upgrade of Facebook’s stock by analyst Merrill Lynch, which brought the company’s market cap back over the $60 billion mark the same day of the report. And when you look at the charts, you can see that Facebook’s stock price has been steadily creeping upwards since mid-October 2012, especially after reported rather strong Q3 earnings towards the end of the month. 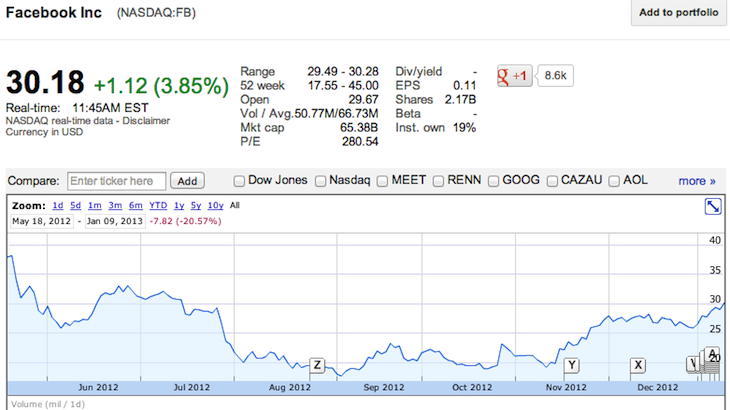 Of course, announcing 1 billion active users in early October didn’t exactly work against Facebook either. For your comparison: bouncing back to a $30 stock price gives the company a public-market valuation of approximately $65 billion, which is just south of e-commerce giant eBay’s current market cap. Looking at historical stock prices, Facebook hit its lowest point on September 4, 2012, when the share price dropped to $17.73. 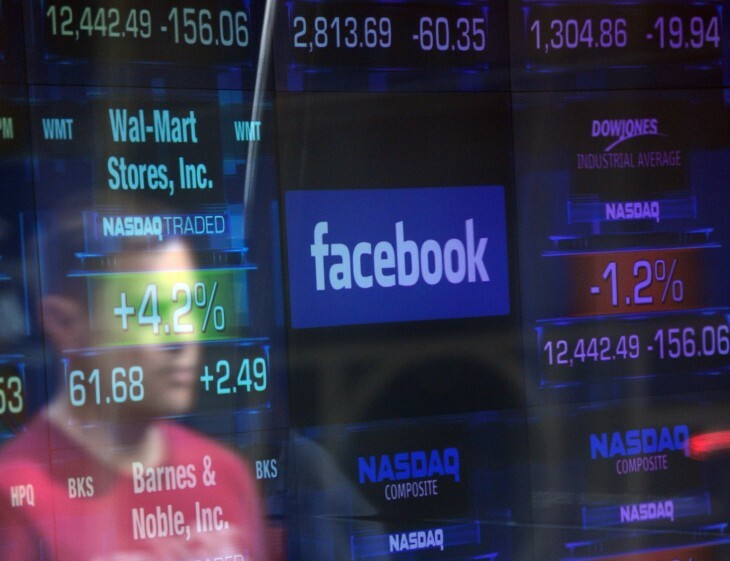 And for some additional perspective: when Facebook made its NASDAQ debut on May 17, 2012, its shares were valued at $38.23 apiece at closing time on the first day. It still has a way to go to make it back to that level, but at least it’s trending in the right direction. Facebook’s fiscal fourth-quarter earnings are due to be released in the coming weeks.